EARLY INFANT ORAL CARE. 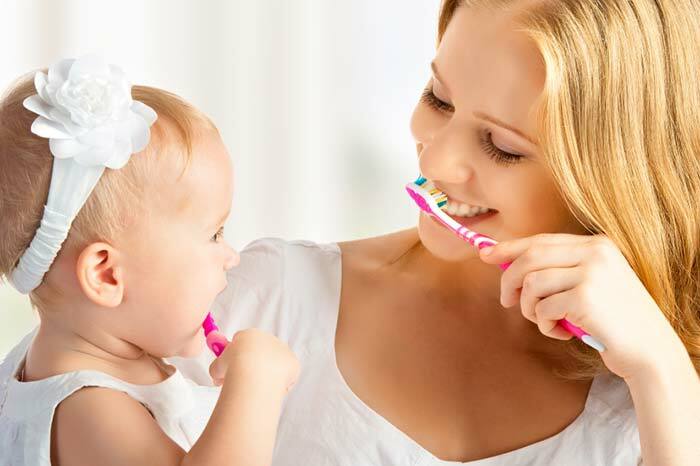 Click buttons for info about pregnancy, teething, baby’s diet, and baby’s oral hygiene! Here is a helpful Tooth Eruption Guide. Note: Not all children fall within these age ranges! It is recommended to take the pacifier away by age 2. A thumb may be harder to address until the child is around age 4. Pacifier use and thumb/finger sucking that persists beyond ages 2-3 can cause problems with the proper growth of the mouth and tooth alignment. Develop an age appropriate reward system to praise and reward them when they are not sucking their thumb, fingers, or pacifier. Try cutting off the tip of the pacifier to slowly ween them off. If these approaches don’t work, remind your child of their habit by wrapping the thumb with athletic or medical tape or by putting a sock on the hand at night.